There is considerable debate – but arguably somewhat less understanding – about what constitutes a “fair” tax system. There is no simple numerical rule that defines fairness. It is, instead, a collective political judgment. There are arguably reasonable conditions for making a sound collective judgment – but they are not met in the real world. If the nation can agree on opportunity as an objective, we are left with a choice: Will we direct our resources to reward the few spectacular successes, as an incentive to others; or will we instead use those resources to limit the tax burden on many ongoing businesses, to facilitate effort? This blog argues for the latter, on both economic and fairness grounds. A frequent form of this question is a lament that “the 1 percent of taxpayers with the highest incomes pay 22.3 percent of the taxes” (typically using the figures published for some time now by the Congressional Budget Office (CBO); the number I quote here is from their latest estimate, using 2009 data, available here). A possible subtext, never articulated, is that because 22.3 percent is greater than 1 percent the tax system is excessively progressive. To interpret that subtext we need a conceptual marker. If the top 1 percent of taxpayers paid 1 percent of the taxes (and the same for every other 1 percent ranked by income), then we would have the numerical equivalent of a head tax – both Warren Buffett and the proverbial elderly widow in the walk-up cold-water flat would write a check (if the widow had a checking account) to the Treasury for the same number of dollars. That probably would not strike too many people as a “fair” tax system. Sometimes the lament is a bit more sophisticated. With a one-layer-deeper dive into the data, it can be worded as “the 1 percent of taxpayers with the highest incomes earn 13.4 percent of the income, but pay 22.3 percent of the taxes.” Again, the unstated subtext can be read that 22.3 percent of the taxes, being greater than 13.4 percent of the income, is too high. But the implied standard that those with 13.4 percent of the income should pay 13.4 percent of the taxes is the numerical equivalent of a single-rate income tax with no exemption or deduction. Both Warren Buffett and the proverbial elderly widow would pay the same 13.4 percent of their income in taxes – and not the marginal rate (on their last dollar of income), but the average rate (the percentage of all of their income that they actually paid). Most Americans probably would question whether that was a fair outcome, either. So if the 1 percent of Americans with the highest incomes earn 13.4 percent of the total income in the country, how much of the taxes should they pay? Probably more than 13.4 percent; but how much more? In truth, there is no simple numerical answer – as the very basic review of the tag lines above suggested. This question can be answered only by the American people themselves, through the political process. There are still optimists in Washington. Many of them probably lean on the old adage attributed (probably wrongly) to Winston Churchill about “…after all of the other possibilities.” But we are running out of time, so we had better begin to discard those other possibilities at a faster rate. One of the “other possibilities” would be the President’s insistence on increasing tax rates in the highest brackets of the income tax schedule. The President isn’t alone in this focus on tax rates; Nate Silver of the New York Times, who earned plaudits for the accuracy of his analysis of the presidential race this year, weighed in along the same lines on a rumored congressional proposal. Both sides in this year’s presidential election campaign have a fair way to go to get real on the budget problem. Democrats are making hay by attacking the only viable tool to bend the Medicare (and health care generally) cost curve. And Republicans are promising very specific steps that would cut income taxes, while keeping their counsel on what they would do to offset the cost (not to mention actually increasing net revenues to reduce the deficit). The tax issue came up again in the campaign debate this week. President Obama challenged Governor Romney to specify how he would offset the cost of the tax rate cuts that he has proposed. 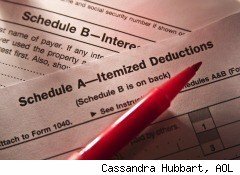 Governor Romney returned to a notion that he had floated earlier: a cap on the amount of itemized deductions that each taxpayer could claim. 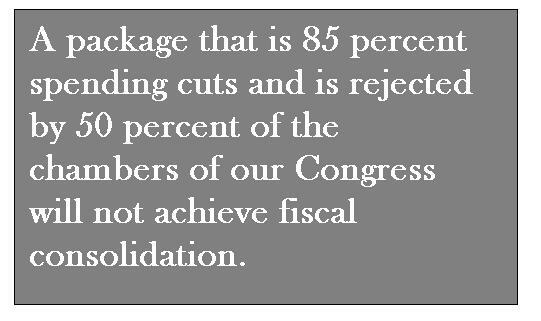 The standard argument for repairing the nation’s hemorrhaging budget is that it would be good for the economy. Many economists are in the lead of the campaign to do so. However, many would-be economists are among the cheerleaders, and some of the chants that you hear make no sense. Still, fixing the budget is an economic imperative. We just need to understand the relevant laws of physics to do it right, and not wind up causing more harm than we avoid. This is the second installment in a series about the two keys – Medicare reform and tax reform – to a comprehensive agreement to solve the budget problem. These commentaries will explain the details of the two issues, and show where it is that each political party – the Democrats and the Republicans – must give ground to resolve this crucial issue. Last week’s post started a series on Medicare reform and tax reform as the two key elements of a solution to the nation’s budget problem – as well as important contributors in their own right to our collective well being over the long haul. It so happens that this week there was a potentially important contribution to the debate over tax reform, which is worth a second installment in this series about these two critical issues. Two weeks ago, I wrote about a claim that increases in tax rates on capital gains reduce revenue (and vice versa). This week, I would like to put that question in the context of the potential for a budget agreement in Washington – which three weeks ago I wrote is not going to happen in 2012, either before or after the election. 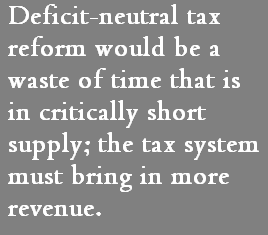 So where will capital gains taxation – and tax reform generally – stand in any budget deliberations? If either party sweeps the board in November, then that party may succeed in resolving the budget issue all by itself, and all in its own way, early in 2013. The House of Representatives can do anything that a bare but unified majority wants to do – essentially overnight. (The “overnight” part is why the staff burn out so quickly, whether their marriages survive or not.) And just about the only thing that a bare majority can do in the Senate is to pass a budget resolution that includes “reconciliation instructions,” which empower that same bare majority to pass a strictly budget-related “reconciliation bill” that is not subject to a filibuster (that is, endless debate – which can be terminated only with 60 votes). If a President of the same party is waiting to sign that reconciliation bill, then, bingo – enormous change can be achieved in a very short time. It isn’t necessarily quite that simple.